today I present you with a couple of fashionable outfits the well-dressed English lady would have worn in 1821. I particularly love the court dress, it is so beautiful, don’t you think? A Cambric muslin round dress; the bottom of the skirt is trimmed with a flounce of scolloped work, disposed in deep plaits at some distance from each other, and the spaces between left plain; in the middle of each space is a muslin tab: this trimming is surmounted by another composed of full puffings of muslin, with lozenges between, and a rouleau of muslin at the top. High body, tight to the shape, profusely ornamented with work, and trimmed at the wrists and round the throat with scolloped lace. Spencer of cerulean blue soie de Londres: it is tight to the shape; the waist is the usual length, and it is finished with a full bow and ends of the same material, corded with satin in the middle of the back. The bust is formed, in a most becoming manner, by a fold of satin edged with a loop trimming of soie de Londres, which goes in a sloping direction from the shoulder to the bottom of the waist. The long sleeve is finished at the hand with satin folds and loop trimming: the epaulette is a mixture of satin and soie de Londres, disposed in an extremely novel and tasteful style, for which we refer to our print. Falling collar, finished with bands of satin and loop trimming. 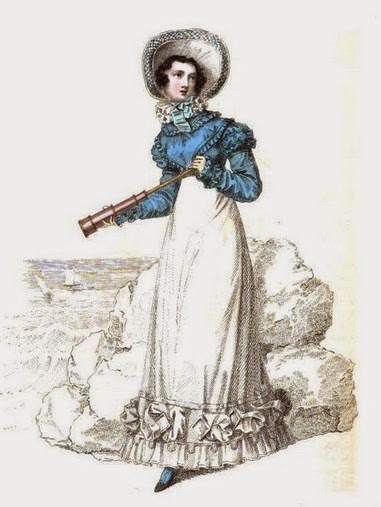 Head-dress, a bonnet composed of white watered gros de’ Naples; the brim, of a moderate size, turns up a little, and is ornamented under the edge with a band of blue tufied gauze; a piece of gros de Naples goes round the crown, cut at bottom and top in the form of leaves, and edged with narrow straw plait. A full bunch of these leaves and a bouquet of marguerites are placed on one side of the crown, and a bouquet of marguerites only on the other. Broad white satin strings, tied in a full bow on the left side. Black kid shoes. Limeric gloves. A white lace petticoat, of Urling’s manufacture, over one of white satin; the trimming of the petticoat consists of gold tissue disposed in folds, and edged with gold cord; train of gold-coloured satin lined with white satin, and trimmed with bunches of gold shells, placed at regular distances: this trimming goes all round. The corsage is tight to the shape; the front is formed of folds, to correspond with the trimming of the petticoat. Sleeves of gold-coloured satin, trimmed with folds of tissue and gold cord; a band of plaited cord terminates the sleeve. A very full Elizabeth ruff stands up round the back of the neck. The hair is divided so as to display the forehead very much; it falls in loose ringlets at the sides of the face. The hind hair is dressed low. A diamond bandeau is placed very low over the forehead; the lappets are of Urling’s point lace: a profusion of white ostrich flat feathers finishes the coeffure. Diamond ear-rings and necklace. White kid gloves, and white satin shoes. We are indebted to Miss Pierpoint of No. 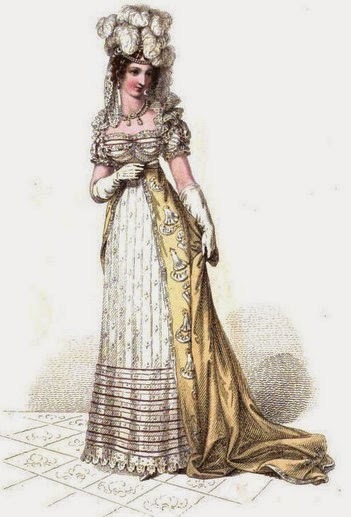 12, Edwards-street, Portman-square, inventress of the corset a la Grecque, for this dress. Would you have worn these dresses, ladies?